Don't leave Sedona without making a trip to the nearby Grand Canyon. See a wonder of the world. Stay in a world of wonder. It’s hard to imagine traveling to the Southwest and not visiting Grand Canyon or Sedona. So why not do both? We believe when you have one of the Seven Natural Wonders of the World in your backyard, take advantage of it. By making Sedona your base camp for a Grand Canyon expedition, you’ll enjoy a much wider array of creature comforts. 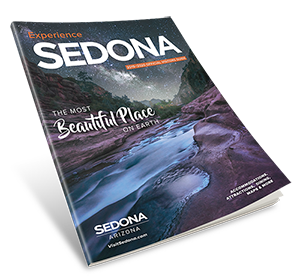 In Sedona you’ll find more places to stay and eat, not to mention spas, shops, galleries and more. At Grand Canyon National Park designated overlooks provide visitors with awe-inspiring views. Walk along the rim in Grand Canyon Village. Snap a photo of mule riders moseying towards the river and peer into the abyss to hear what secrets are echoed there. Then it’s time to come back home to Sedona, where all the incredible sights are just outside your door. Blessed with a beauty that’s epic yet intimate, grandiose yet personal, people seem to make a very special connection to Sedona. No overlooks or mule rides are required. Sedona is so close to the Grand Canyon. 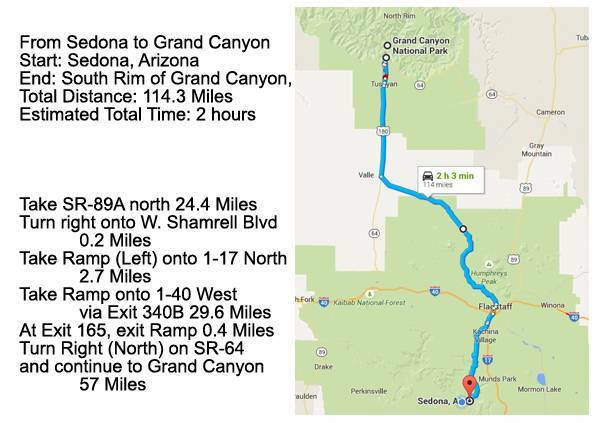 Here’s a two day itinerary with suggestions for things to do as you are stopping in Sedona, Arizona during your Grand Canyon vacation. We’ve included a handy map and driving directions to help you on your way. Experience a self driving tour through Oak Creek Canyon ~ Flagstaff ~ Grand Canyon National Park. This scenic drive is stunning, with many points of interest along the way. Participate in a guided van tour to the Grand Canyon National Park. Go on a train ride between Williams and the Grand Canyon National Park. Have lunch at the Grand Canyon National Park. There are so many stunning visits and places to enjoy your meal. Get your heart pumping with some hiking in the dramatic Red Rock Country. Go on an early morning hot air balloon tour. Pamper your body and soul at a spa. Visit Camp Verde’s Casino for some gaming action.